One of the things I love about Canada is the way multiculturalism is embraced. (In fact, there is even a law to that effect.) With residents representing more than 200 ethnic groups, Toronto is arguably one of the most culturally diverse cities in the world. Lucky for me, this translates into an abundance of amazing, authentic ethnic food all across the Greater Toronto Area. In some cities, it seems, the suburbs tend to be dominated by chain restaurants, but the same cannot be said for Toronto. I'll admit that my knowledge of the Toronto suburbs is pretty much limited to the areas to the north, particularly Richmond Hill and Markham, where a large Chinese community calls its home. As a result, one can find many independent restaurants serving high-quality East Asian cuisine in these neighbourhoods. 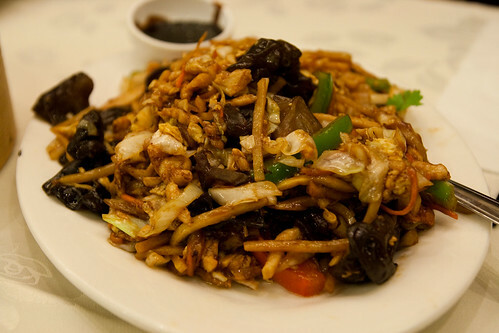 Within the Chinese cuisine there are a number of regional sub-cuisines. Last week, I met up with a long-time friend and her husband at Chili Secrets in Richmond Hill, which serves food from the northern parts of China. 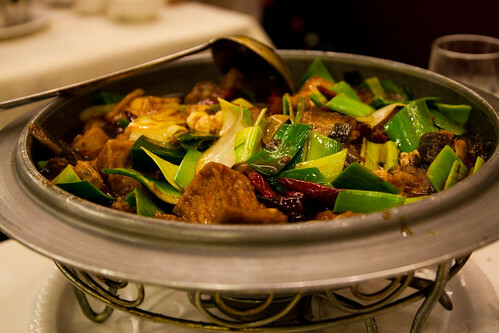 The defining feature of Northern Chinese cuisine seems to be the spiciness factor - hence the word "chili" in the name. We decided to each pick one dish on the menu and share everything family-style. My friend's husband picked the Grilled Lamb Kabob not realizing that I'm not a big fan of lamb, but I decided not to say anything as I figured there'd be plenty of other food to fill me up. When the kabobs came, I graciously picked one up to try - I'm always willing to try before I judge - and I was quite shocked by how good these turned out to be! The meat actually tasted like pork to me, and lacked that "funny" taste I find so unpleasant in most lamb I've had. The spiced rub they used on the meat was absolutely delicious. 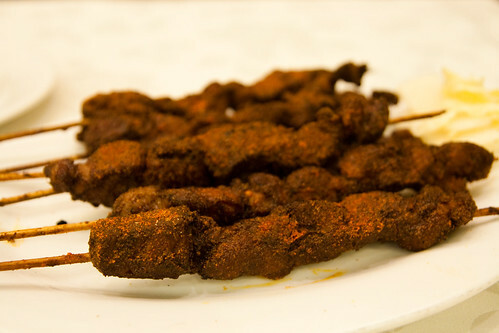 I liked this lamb kabob a lot and I very, very rarely (maybe only on one or two other occasion) like lamb. 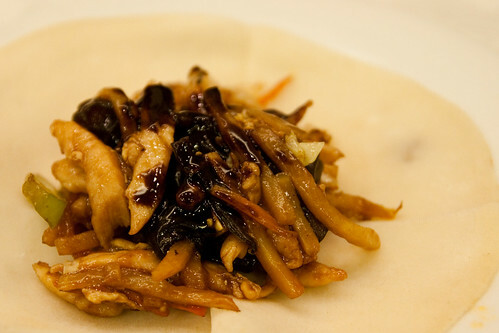 My friend's selection was the Moo Shu Chicken which comes with little thin, flour wraps. It was tasty as well, and not too spicy compared to other items on the menu. My choice was the Spicy Garlic Catfish with Tofu, which comes in a hot pot which the server ignited to keep the dish simmering for the duration of our dinner. This was the spiciest of the three dishes we ordered, and it was just fantastic. Some might find this to be on the too-spicy side, but I thought the spice level was pretty good, and I typically order "medium" curry when I'm given a choice, so it's not like I'm used to extreme amounts of heat. The tofu and catfish were cooked in a thick sweet and spicy broth that's pretty much just divine. My friends were sweating from the spiciness, but kept eating anyway because it was so good. The only caution I have for this dish is that the fish is not de-boned, so one must be careful with that. Also, the dish is quite large, and try as we might, we just couldn't finish it. Overall, I was quite impressed with Chili Secrets. For someone who doesn't normally crave Chinese food, I actually want to go back to this place, though the Northern Chinese cuisine isn't something I'm used to so I did enjoy the little bit of variety. The service is pretty standard for a Chinese restaurant, I think, but we did stay there for over three hours chatting and never once did we get the sense that they wanted to kick us out, which we quite appreciated. Also, the fact that we paid less than $15 each to be completely stuffed made this a restaurant of great value as well!